The Common Core State Standards hold promise for low-income students, students of color, English language learners, and students with disabilities, who traditionally perform significantly worse than their peers. The Common Core helps address inequity in education by ensuring all students are taught to the same high standards and held to the same rigorous expectations. This helps make sure that ZIP codes do not determine education quality. The Common Core-aligned assessments are integral to realizing the promise of the standards; they act as a quality-control check to ensure all students receive a high-quality education. A Common Core-aligned curriculum will create a more challenging and exciting classroom experience. Students will explore concepts deeply, work together to solve complex problems, and engage in project-based learning—instead of focusing on worksheets and rote memorization. The Common Core-aligned assessments, developed by two nonprofit consortia of states, set a rigorous and high benchmark against which all students will be measured. • Students of color and low-income students have less access to more rigorous coursework. Black students are 28 percent less likely than their white peers to enroll in algebra in eighth grade—a significant predictor of future academic success—even when they are high performers in fifth-grade math. This problem persists in high school: Only 29 percent of schools with the highest percentage of black and Latino students offer calculus, compared with 55 percent of schools with the lowest percentage of black and Hispanic students. 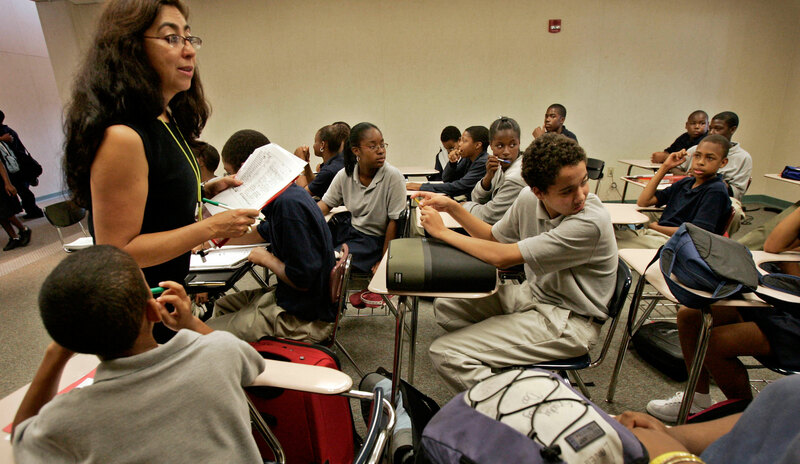 • Students of color and low-income students are more likely to be taught by inexperienced and out-of-field teachers. In high-poverty schools, 27 percent of classes are taught by out-of-field teachers compared with only 14 percent in low-poverty schools. In high-minority schools, twenty-two percent of teachers have three or fewer years of experience, compared with only 13 percent in low-minority schools. • Students of color; low-income students; students with disabilities; and English language learners, or ELLs, are less likely to graduate from high school on time. During the 2009-10 school year, only 66 percent of black students, 71 percent of Hispanic students, and 69 percent of Native American students graduated in four years, compared with 83 percent of white students. According to 2010-11 school year state-level data, less than half of states had graduation rates above 60 percent for students with disabilities and ELLs. • Between 1995 and 2009, there was a disparity by race in college enrollment rates at the 468 most selective four-year colleges in the nation. Eighty-two percent of new white enrollments attended these schools, while only 13 percent and 9 percent of new Hispanic and black enrollments, respectively, attended them. • At public institutions, nearly one-third of first-year black and Hispanic students enroll in remedial courses. • Among full-time, first-time students seeking bachelor’s degrees, 40 percent of black students, 52 percent of Hispanic students, and 40 percent of American Indian and Alaska Native students earned a degree in four years, compared with 63 percent of white students. • By age 24, young adults from families in the highest income quintile are more than seven times as likely to have earned a bachelor’s degree as students from families in the lowest income quintile. The Common Core will improve education quality for all students—particularly traditionally underserved students. Raising standards and preparing all students for college and careers will help reduce the disparities identified for low-income students, students of color, ELLs, and students with disabilities.